This photo of the Suchomimus mount was taken from the side. From this shot the elongated vertebral (neural) spines stand out and are very easy to see. These spines, which run down the back of Suchomimus, grew to over a foot tall, and likely supported a large sail. Suchomimus' long, narrow skull is also very evident in this shot, as are its powerful forearms. The total body length of Suchomimus was somewhere near 40 feet, making it about as larger, or larger, than T. rex. 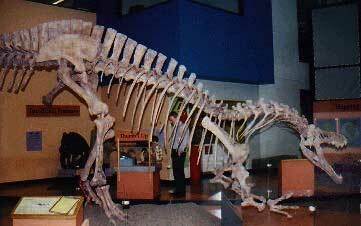 In his 1998 Science paper Paul Sereno hinted that the Suchomimus specimen he found, the one casted and exhibited at the Children's Museum, wasn't likely full grown. In other words, he said, in life an adult Suchomimus may have been about 3-5 feet longer. See Steve Brusatte's web site Dino Land.